It was April, 2010. I took my mom to visit my daughter and her four children about 150 miles away from where we lived. My daughter’s house is not the calmest place with 4 little ones running around and the youngest just eight months old; my mom loved children, but in her waning years, children sometimes made her nervous. I was a little concerned about how she would fair. 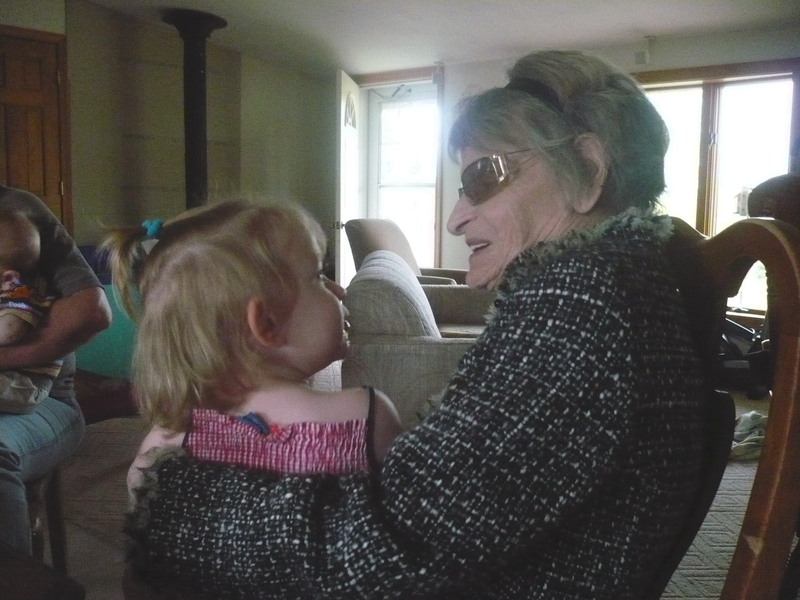 My daughter’s older two had met their great-grandma, but the 8-month-old and 2 1/2 year old Naomi, my only granddaughter, hadn’t. It didn’t take long for Naomi to approach her great-grandma. 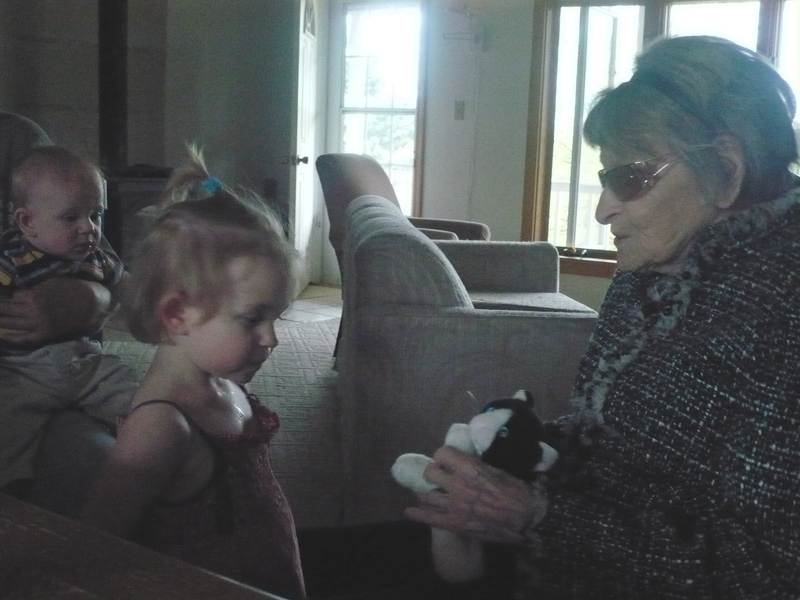 She began by taking her little stuffed cat and showing it to Great-grandma, who took the kittie and began talking to Naomi. Next thing you know, Naomi was sitting in Great-Grandma’s lap, chatting away. It was a long journey for my mom. That’s why we hadn’t done it before. I’m so glad that we finally got to make that trip and she got to see great-grandchildren she had met and meet the ones she hadn’t, as well as see their mother, her granddaughter. There’s something special about grandparents and grandchildren and it was magical to see Naomi sitting in my mom’s lap as if she had been there all her life! I don’t know if Naomi will remember meeting her great-grandma, but I can’t help but believe that something special happened in her heart that will be there all her life. I’m making sure she has a picture to remind her of that special moment. I really enjoyed your story about your Mom as Great-Grandma. I think of her often, & can understand that little children would be drawn to her. I’m glad she had that opportunity. She was indeed a special lady.